Do you think of yourself as a mentor? Are you regularly counseling and giving advice to others, pushing them to believe in themselves and do more than they might otherwise do? No matter what level you are in your career, you can be a mentor to someone else. Although mentoring takes time and energy, as a mentor you have the opportunity to consolidate your own thinking while sharing your opinions and expertise. You will benefit from personal growth as you spend time with people who have different perspectives and knowledge than you, and by engaging with them, you will have the opportunity to hone your own interpersonal skills. Mentoring gives back as much as you give out, helping you expand your network and build a team that can help you be successful in the future. Additionally, supporting others as they grow provides a profound sense of personal satisfaction and fulfillment. Reach out and be a mentor to someone else. It’s not necessary to be in a formal mentoring program to be a mentor. In fact, informal mentoring relationships are often the most powerful because they start by caring about someone else and wanting to help them. As a mentor, it’s important to listen without judgment or assumptions, learning about the individual, their background and aspirations. Expand their thinking by offering ideas, suggestions, experiences, and sharing contacts or opportunities. Help them think through what they need to learn or what skills they need to acquire, and don’t be afraid to give critical feedback to help them stay on track and maintain their focus. Look for the best in the individual, and then set high expectations, expressing a belief that they can meet those expectations. People are often drawn to those who are similar to themselves, but reaching out to someone who is different than you often leads to the richest mentoring relationships. Be open to working with someone of a different gender, race, ability, or background. Remember: Mentoring is a two-way relationship, so spend your efforts on relationships in which your mentee is fully invested. 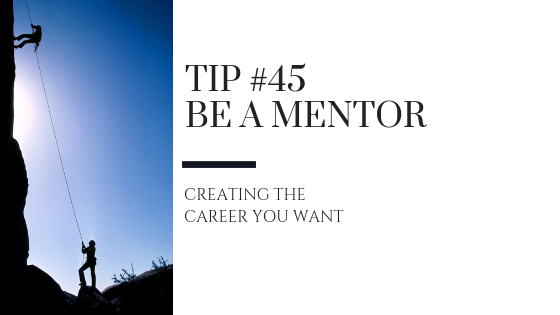 Look for ways to be a mentor as you create the career you want.